Yeah, “It,” recording the objects I see as I travel the deep, deep sky with my beloved telescopes. What did you think I meant? Your Old Uncle Rod has been doing astrophotography for nigh on 45 years, since that first magical evening when I lined-up the lens of my Argus box camera with the eyepiece of my Tasco 3-inch Newt in hopes of getting a picture of a fat full Moon (you can see the—ahem—"results" by going here and scrolling down). One thing I’ve done regularly since I was a sprout is draw what I see in the eyepiece. Yep, funny little sketches done with pencil and paper. Nothing’s more low-tech than that, I’ll admit, but, surprisingly, nothing can be more rewarding. When I was doing my city observing book, The Urban Astronomer’s Guide, I had the occasion to pull out a bunch of my old logbooks and pore over the hundreds of eyepiece drawings I made between the mid 80s and the present (sadly, my logs from my first 20 years of amateur-dom have disappeared over the course of numerous moves and, well, uh, “several” marriages). What did I glean from this trip down memory lane other than some drawings to use in the book? A renewed sense of how wonderful and valuable deep sky sketches are. In some ways they are better than the hugest, best guided CCD images you or me or anybody else can bring home. How can that be? How can a simple HB pencil costing fifty cents best an umpteen thousand buck CCD cam in any way? Well, first off, nothing, and I do mean nuttin', is better at showing how deep sky objects look visually in a telescope than a carefully and skillfully made drawing. Want to know how the latest Meade-o-tron wonder will show M13? Don’t look at a half-hour CCD image taken with the subject scope. Those remarkable CCD cameras can go insanely deep, even with a 66mm refractor, but that has no relation at all to what your eye will see in the eyepiece. Look for a drawing. Where? There are plenty online now. Seems as old Unk ain’t the only observer still interested in the Luddite way of picture taking. Two great resources are Deep Sky Observing and Sketching (formerly Skyrover Sketches), and the very active sketching forum on the Cloudy Nights Website. Again, a good drawing comes much closer to the way objects look in the eyepiece than any photograph or digital image ever will. What else good? You may not think of your humble sketches as “art,” but they are. Once you get into the sketching groove, you’ll come to realize why painting and drawing have survived alongside photography for going on two centuries. They don’t just show what is in the subject, they show what is in the observer’s mind. I don’t mean you should go KUH-RAZY, drawing in enormous spiral arms when none were seen in the scope—a drawing should be a record, too—but, for example, rather than trying to record every single star in M13 placed exactly as in the eyepiece, allow your impressions to have a little free reign. If you see the stars on the east side of the glob as forming a spiral pattern or a spider’s leg, allow some of that to enter the drawing. This is the truly remarkable aspect of sketching, and is what made those old drawings of mine seem so fresh. 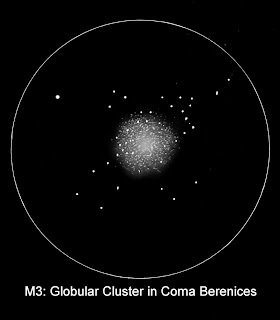 Looking at my picture of M13 from a 1987 summer’s eve, I not only recovered the way my Super C8 Plus showed the Great Cluster, but what it looked like to me, and, with that, a strong waft of memories of a long ago night. --Don’t make your sketches too small. It’s much easier to draw things big. I like to use the 11x9-inch sketch “diaries” I buy down to the corner Walgreens Drugstore (“Chemist” for you UKers…you know, like good, old Boots). Before going outside, I’ll draw a series of 6 – 7-inch "field circles," one per page, using a compass and a fine tip marker. --How do you hold a pencil, a sketch pad, and a red flashlight all at the same time? You don’t. It ain’t easy, anyhow, though I’ve done that. These days I illuminate the sketch pad with one of them red “head (band) lights” you find in the hardware stores, which makes for a nice, hands-free sitchy-ation. Be forewarned the red LEDs on most of these thangs are way too bright. I’ve had success dimming ‘em down with a little of Miss Dorothy’s nail polish. --Can you use a Dob for sketching? How can you nudge and smudge at the same time? A driven scope does make life easier, sure, but after a while the nudge-sketch, nudge-sketch routine become as easy as pie—no fooling. --What do you draw on? One of the aforementioned sketch diaries provides a nice firm surface. If you choose to use single sheets of paper, a clipboard like the Rubbermaid Storage Clipboard works great. It snaps open and provides a nice place to store pencils and paper too. --What do you draw with? In the field I only use pencils. Drawing pencils (from an art supply store) in grades from about 3H to 6B. For erasing and detail work I use an art gum eraser, also from the art store. --How do you produce smooth, blended nebulae and galaxies? In the field, I don’t. Instead, I make notes on the paper, “smooth, clumpy,” and just fill in the appropriate tone with the pencil as best I can. Next morning I use my finger (or a “blending stump” from the art store, natch) to smooth M51’s graceful arms. --I sometimes redraw field stars using a fine point marker the next day, but lately have taken to using the air brush function on my PC draw/paint/imaging program to make the stars look nicer and more even. I like to reduce “hardness” to zero on this function, which gives the stars an attractive “soft” edge. --Obviously, to modify my drawings on the PC, I must scan them into the computer, something I’d do anyway. Not only does that get them into a format that is suitable for posting on the web or inserting into the log I keep on my PC with the help of an observing planning program, it means I have backups in-case my logs go missing. --As hinted above, if at all possible I try to finish my drawings the very next morning, before my memories of the way the objects looked begin to fade. Certainly, you’ll need to finish/improve your drawings by light of day. What you did under red light will probably look like Hell…BUT… Take care and beware not to add details you didn’t really see. As you can no doubt tell, Your Old Uncle is a huge fan of Eyepiece Drawing. Not only have my little sketches provided an endless source of pleasant observing memories, they have, I think, added a lot to the books and magazine articles I’ve used 'em in. That doesn’t mean I think they replace digital imaging or should. Sketches and digital images are very different things. CCD pictures (when I can get ‘em to turn out) are great. They allow me to go deep and "see" things I never thought I’d see with my telescopes. My drawings, though? They don’t go near so far into the Great Out There, but they have one huge advantage over the latest mega pixel wonder: they don’t show how those ancient photons impacted a chunk of silicon, they show how they impacted my heart.